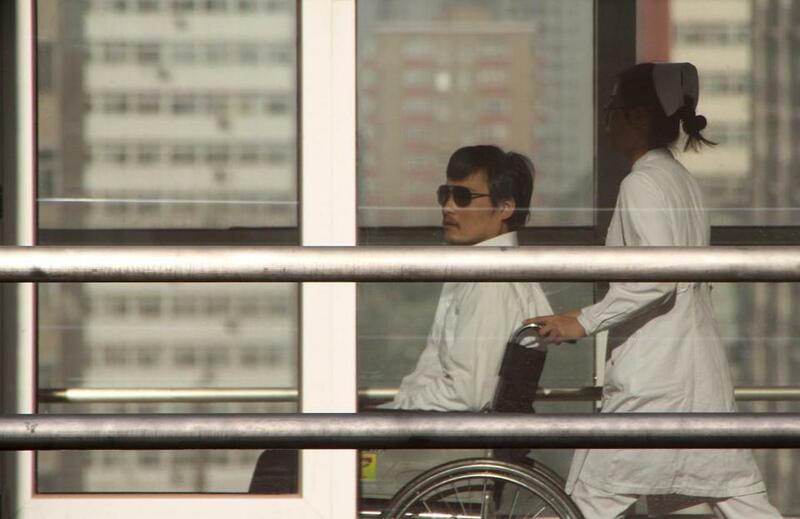 Chinese activist Chen Guangcheng was seen in a wheelchair pushed by a nurse at the Chaoyang hospital in Beijing. BEIJING (AP) — The blind Chinese activist at the center of a six-day diplomatic tussle between the U.S. and China said he fears for his family’s lives and wants to leave China, hours after American officials announced an agreement with Beijing that was to guarantee his safety. Chen Guangcheng escaped from illegal house arrest and other mistreatment in his rural town, placing himself under the protection of U.S. diplomats last week. On Wednesday, after six days holed up inside the American embassy, he emerged and was taken to a nearby hospital. U.S. officials said they had extracted from the Chinese government a promise that Chen would reunite with his family and be allowed to start a new life in a university town. Hours later, however, a shaken Chen told The Associated Press in a telephone interview from his hospital room that U.S. officials told him the Chinese authorities would have sent his family back to his home province if he remained inside the embassy. He added that, at one point, the U.S. officials told him his wife would have been beaten to death. State Department spokeswoman Victoria Nuland said in a statement that no U.S. official spoke to Chen about physical or legal threats to his wife and children. Nor did the Chinese relay any such threats to American diplomats, she said. She did confirm that the Chinese intended to return his family to their home province of Shandong, where they had been detained illegally and beaten by local officials angry over Chen’s campaigns to expose forced abortions, and that they would lose any chance of being reunited. The differing accounts could not be immediately reconciled. But the turn in Chen’s fate comes after nearly seven years of prison, house arrest and abusive treatment of him and his family members by local officials. Chen’s flight into the protection of U.S. diplomats in Beijing last week had created a delicate diplomatic crisis for Washington and Beijing. It also threatened to derail annual U.S.-China strategic talks with U.S. Secretary of State Hillary Rodham Clinton starting Thursday. Under the agreement that ended the fraught, behind-the-scenes standoff, U.S. officials said China agreed to let Chen and his family be relocated to a safe place in China where he could study at university, and that his treatment by local officials would be investigated. Chen, 40, said he never asked to leave China or for asylum in the U.S. and said American officials reassured him they would accompany him out of the embassy. At the hospital, Chen was reunited with his wife, his daughter and a son he hasn’t seen in at least two years. But after they got to his room in Chaoyang Hospital, he said no U.S. officials stayed behind and that the family is now scared and wants to leave the country. Chen had become an international symbol for human dignity after running afoul of local government officials for exposing forced abortions carried out as part of China’s one-child policy. He served four years in prison on what supporters said were fabricated charges and was then kept under house arrest with his wife, daughter and mother, with the adults often being roughed by officials and his daughter searched and harassed. His dogged pursuit of justice and the mistreatment of him by what seemed like vengeful local authorities brought him attention from the U.S. and foreign governments and earned him supporters among many ordinary Chinese. The differences over his security aside, leaving Chen in China is risky for President Barack Obama. Washington will now be seen as party to an agreement on Chen’s safety that it does not have the power to enforce. Clinton said in a statement that Chen’s exit from the embassy ‘‘reflected his choices and our values’’ and said the U.S. would monitor the assurances Beijing gave. ‘‘Making these commitments a reality is the next crucial task,’’ she said. The discrepancies also muddy an agreement that would have shelved, at least temporarily, a predicament that threatened to move human rights to the front of a U.S.-China agenda crowded with disagreements over trade imbalances, North Korea and Syria. With Chen out of the way, in theory, Clinton, Treasury Secretary Timothy Geithner and their Chinese counterparts would be set to focus on the original purpose of their two-day talks starting Thursday: building trust between the world’s superpower and its up-and-coming rival. Even so, the Chinese Foreign Ministry signaled its pique with the affair, demanding that the U.S. apologize, investigate how Chen got into the embassy and hold those responsible accountable. ‘‘What the U.S. side has done has interfered in the domestic affairs of China, and the Chinese side will never accept it,’’ Foreign Ministry spokesman Liu Weimin said in a statement. The officials refused to say if Washington would apologize. One official said that embassy staff acted ‘‘lawfully’’ and in conformity with policy, suggesting that the U.S. does not believe it has anything to apologize for. The arrangements for Chen carries risks as well for China’s government, which worries about encouraging activists and government critics. As news spread that he had been taken to the hospital, in the eastern part of the city, media crews and a few supporters gathered outside. A man stood in front of the gate at the hospital and held up a sign saying ‘‘Freedom for Guangcheng, Democracy for China’’ for a minute before police took him inside. The hospital’s name became a banned search term on the much-censored Chinese Internet, joining a long list of permutations for Chen’s name. The U.S. officials said Chen would be settled outside his home province of Shandong and have several university options to choose from. They also said that the Chinese government had promised to treat Chen ‘‘like any other student in China’’ and would investigate allegations of abuse against him and his family by local authorities. Associated Press reporters Charles Hutzler and Gillian Wong contributed to this report.